Well since the carpet went down, not much has been happening. I have started to acquire some storage solutions for the train stuff, and am currently working on getting the workbench in place. Andrew and I setup Bowen Creek a few weeks ago and have been carrying out testing on some new locomotives and the suspension systems prior to our appearance at Thornleigh in June. Over the last few days, I have been thinking about how I will tackle the first stage of benchwork construction. I think I will start with the storage yards, lay all the track and turnouts, then work my way around to Kankool. I have also designed the DCC route definitions for the storage yards. There will be a total of 32 turnouts, with 33 separate routes in and out of the yards. The routes will be defined in the EasyDCC command station. Just to finish off this post, I have drawn up the layout track plan schematic. I will use this to determine how many DCC sections I will split the layout into. Just thought I would post some statistics about the new trackplan. These are approximate only, and could change as construction commences. For comparison, the prototype distances are in brackets scaled to 1:87.1. As can be seen, the model distances will be approximately 70% of the prototype, apart from Ardglen to Pangela which is about 85%. I wanted to achieve long running distances between the locations. I may yet still be able to increase the crossing loop lengths perhaps up to around 80%. The distance from Pangela back to the storage sidings is unknown yet, as I haven’t completely calculated the helix track length yet. Total running length from the start of the storage sidings to where the helix starts is 340 feet, which equals around 5.6 miles or 9km in prototype distance. Not bad considering from Pangela signal box to Kankool signal box was 5.3 miles or 8.59km. As promised, here is the layout plan. It is in two parts to show the different levels. Part 1 is from the start of the storage sidings climbing to Kankool then onto Ardglen. Part 2 continues from Ardglen through the tunnel then onto Pangela. From Pangela, the line continues into a helix to drop back down to the level of the storage sidings. From the helix to the storage sidings will be hidden and not scenicked. The grid on the drawing is 12 x 12 inches. This is basically the final draft, but will be open to changes as construction begins. Modelling comes to a halt….again!!! Just a quick update to what I am up to. Well, I have finally come up with what I hope is the final layout plan for the train room downstairs. 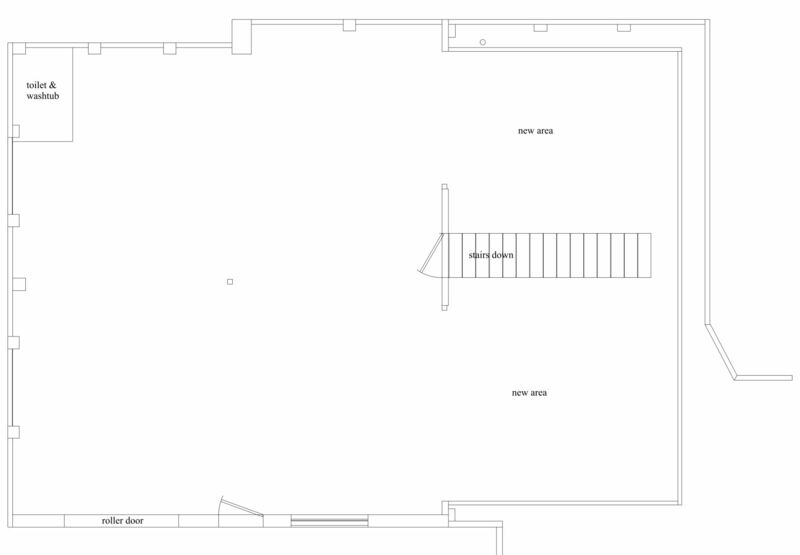 Over the last month or so, I have had engineers and my builder in to look at what is required to expand the current downstairs room further under the house. Since my post of 11 March where I indicated I was looking at digging out a small area under the house, removing some piers etc, I realised this addition to the main room still wouldn’t allow me to fit the layout in how I wanted it. So, after some more measurements under the house, and some changes to the CAD drawing of downstairs, I ended up with a plan to extend the whole room back past the stairwell to the existing footings of the garage. Click here for the drawing. There will be four more piers removed and two extra steel beams installed. The new room design along with the revised layout plan also does away with duckunders, so the stairs will now open into the room, and the layout will be full walkaround. The new room will be around 103 square metres. The trackplan has changed quite a lot from the original room design, and now will have Ardglen at around 62 inches from the floor, with a rising grade from Kankool to Ardglen. Kankool will be at around 46 inches. 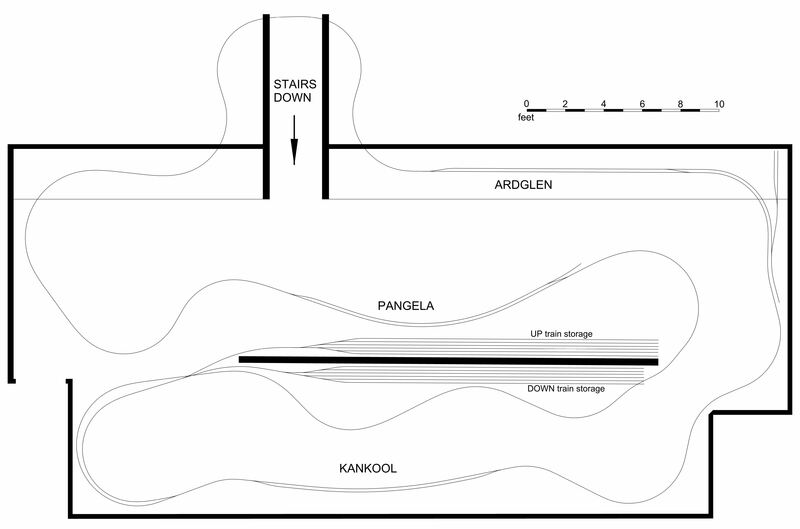 However, Pangela will be at the same level as Ardglen, with a helix to drop the trains back to the level of Kankool. I have also managed to fit in staging loops which I couldn’t before. These will be underneath Ardglen. I’ve managed to get quite long runs between each crossing loop which is what I was trying to achieve. I’ll try and post the trackplan soon. I’ll also keep you updated with construction progress.